The latest entry into J.K. Rowling’s Wizarding World is finally here! Fantastic Beasts: The Crimes of Grindelwald is in theaters, and no doubt you’ll want to know all about what went into creating this fantastical world. Newly released on Audible, Fantastic Beasts: The Crimes of Grindelwald—Makers, Mysteries, and Magic, by Mark Salisbury and Hana Walker-Brown, aims to take you on a journey behind the scenes in a truly unique way with an exclusive audio-only format. Makers, Mysteries, and Magic succeeds in providing a highly informative and entertaining presentation, with narration by Dan Fogler (Jacob Kowalski in the films). Makers, Mysteries, and Magic has a running time of just over five hours, with nine chapters varying in length from 18 to 54 minutes. Fogler’s narration captures the listener immediately, with charm and humor and the knowledge that comes from being an actual member of the production. Even so, you get the feeling at times he’s learning along with you, and that makes him even more appealing as a narrator. The sound quality is amazing (I listened on my iPad mini, via earbuds), and while it might seem odd to listen to a documentary on the making of a film -- I was a bit apprehensive at first -- you find yourself immersed in the process of world-building nonetheless. The presentation features a bevy of interviews with cast members, such as Eddie Redmayne (Newt Scamander), Jude Law (Albus Dumbledore), and Katherine Waterston (Tina Goldstein), Alison Sudol (Queenie Goldstein), Ezra Miller (Credence Barebone), Zoe Kravitz (Leta Lestrange), director David Yates, producer David Heyman, composer James Newton Howard, as well as a multitude of creative forces behind the scenes — from the make-up department to costuming, from set design to creature creators, and much more. It's always welcome when all those names we read in the credits have their moment to shine. Honestly, Makers, Mysteries, and Magic is filled with fascinating bits of information from every corner of the filmmaking process. If you're a fan of all the "making of" featurettes that accompany most Blu-ray or digital film releases, this should be right up your alley. Over 100 hours of interviews were conducted for this audio documentary, and this could easily have been longer than the five-hour runtime, or even made into a series. Condensing all of that content down to the time allotted is an impressive task -- and one I don't envy. However, I'd welcome hearing more from key people at some point. While not spoiler-filled, some plot points are hinted at, and, as such, I'd hold off on listening to this audiobook till you've seen the film. You'll benefit greatly by having the visuals already in your head, and have a much deeper appreciation for what you learn during the audio presentation. As something of an experimental endeavor, Makers, Mysteries, and Magic largely succeeds. I listened over the course of two days, and it was time well-spent. As I said, I wasn't sure what to think of a purely audio documentary on the making of something clearly of a visual nature, but I'm pleased I had the opportunity to check it out for myself. It certainly was an enjoyable way to expand my movie-going experience beyond the familiar. 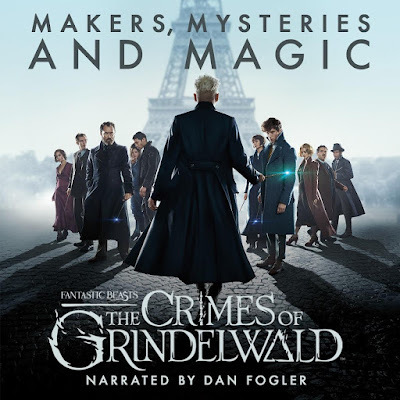 Fantastic Beasts: The Crimes of Grindelwald -- Makers, Mysteries, and Magic is produced by Pottermore Publishing and Audible Originals. Thank you to Audible for providing this audiobook for review purposes. Contact Lisa Dullard at lisad@coffeewithkenobi.com.